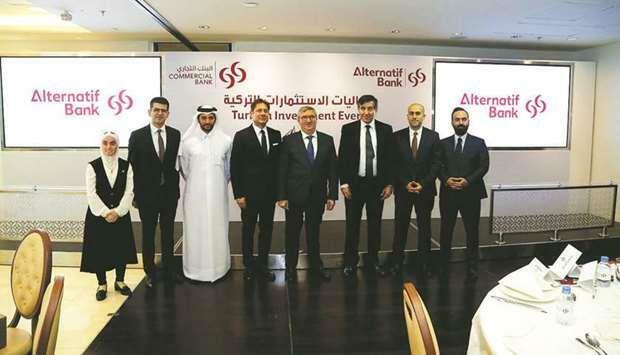 (MENAFN - Gulf Times) Commercial Bank and its Turkish subsidiary Alternatif Bank have partnered with Investment Office of the Presidency of the Republic of Turkey to host an investment event in Doha featuring Turkish venture capital funds for the bank's high net worth customers. Addresses were delivered by Fikret Ozer, Turkish ambassador to Qatar; Ahmet Burak Dagl?oglu, vice president, Investment Office of the Presidency of the Republic of Turkey; and Alternatif Bank CEO Kaan Gur. Guests then heard a technical presentation on the Turkish venture capital and startup ecosystem, followed by presentations from four Turkish venture capital funds. One-to-one meetings with Turkish venture capital funds and potential investors were arranged after a networking lunch. To open proceedings, Commercial Bank executive general manager (International Banking) Fahad Badar, stated that 'Turkey and Qatar are two brotherly countries and that Commercial Bank and Alternatif Bank together consider themselves at the forefront of the strategic relationship between Qatar and Turkey. Badar said, 'Commercial Bank and Alternatif Bank's support for two-way investment between Qatar and Turkey is among our top priorities. We are two well-established banks on both sides, and through close collaboration and cross-border expertise we can effectively facilitate trade, serve the banking needs, and provide investment opportunities for parties in Turkey and Qatar. Gür said, 'Turkey continues to attract the attention of international investors thanks to its young population, its agile composition that can easily adapt to technology and its strong finance industry. Turkish start-ups achieved an outstanding success last year by striking important deals and attracting investments. They have shown that they have a huge potential with their accomplishments. 'We believe that this meeting is a great opportunity to promote the high-potential start-ups in our country to Qatari investors, and we are pleased to support this process with Commercial Bank's support and our experience in the banking industry. Our support for these ventures will continue in the future. Commercial Bank executive general manager (Consumer Banking) Amit Sah said, 'The Turkish venture capital investment event is another example of how the Commercial Bank Group leverages our international franchise to provide our clients access to a wider choice of investment opportunities. 'This event with Alternatif Bank was organised with our high net worth customers in mind who are looking for new and perhaps unique investment opportunities as part of a broader investment strategy. We would always recommend a financial review with our qualified advisors as part of the decision making when building a balanced portfolio.